WILLIAMSBURG, Iowa - Austin Blythe has started every game for the NFC Champion Los Angeles Rams this season. Now the Williamsburg, Iowa native and former Hawkeyes lineman has a chance to play and win in the Super Bowl on Sunday in Atlanta. Playing for the Rams, however, was far from the first choice when Blythe was cut by the Indianapolis Colts in 2017. "They basically said anywhere but Los Angeles, " said Blythe's father, Curt. "So it's not been without mental and physical struggles, and that's what I'm most proud of for him. I mean, he kept working, earned that job the first two weeks." Blythe's father has watched intently as his son moved from versatile backup with the Colts to starting right guard with one of the league's best offenses. 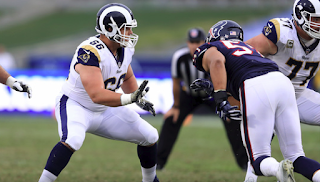 "He likes the guys there," Blythe said, "really enjoys the environment and the culture that Coach McVay and Coach Kromer, his offensive line coach, has established and continues to foster." Austin's high school coach and father-in-law Curt Ritchie said the lessons learned from Kirk Ferentz and the Hawkeyes have also helped him in the league. "For him, it's just what he's been doing for five years at the University of Iowa," said Ritchie. "You know, the meetings, the tape study, the preparation part of it, I think he just feels like it was an extension of what he was already doing." And just like with the black-and-gold, Blythe has found great success in Los Angeles. "Coach Ferentz and his program, he really preaches details, techniques and fundamentals. That's what's gonna make you a good football player and help you win games. And that's exactly what the NFL is about," Blythe said. "I work hard. I pay attention to the details and then it just really helps that I got a lot of great coaches and teammates." That perfect mix has Blythe one victory away from a Lombardi Trophy, something both Ritchie and Austin's father still can't quite believe. "Playing in a NFC Championship game, and now a Super Bowl?," Curt Blythe said. "No, it's just...we're just incredibly blessed." And both men know Austin will be fulfilling a childhood dream -- win or lose in Atlanta. "Going into this last game down in New Orleans you think he's one win from starting in the Super Bowl game then still the next morning you wake up and think 'did that really happen? '," Ritchie said. "I think sometimes we tend to dream too small. And yeah...he's just proven that this can happen."